To be honest, I did not think much of what I had seen and heard on the latest iOS update (4.3). I am in the Apple iOS Developer program and had been running one of the earlier betas for quite some time and never felt compelled to keep up. I did, however, go ahead and update to the final release tonight. After going through my usual post-update dive into the settings to see what was up, I enabled Home Sharing. I knew what Home Sharing was. Basically, it allows you to connect to an iTunes library running on a Mac or PC and stream that content to your iDevice. It sounds so simple. But the first time you actually do it... it is an amazing feeling to see all of your music and all of your video seemingly available to you on this tiny little device. Granted, I have a 32GB iPhone 4 and that fits quite a bit of stuff. I still find myself having to manage what goes on the phone if I know I might not be local to my iTunes. Home Sharing does not necessarily change much here and I'm sure that some of you are pointing out the fatal flaw: this all has to happen on the same WiFi network. While I will admit that it would be nice to have all of my media stored somewhere and be accessible from my devices wherever I may be, this is a great first step. You know how Netflix talks about relatively small numbers of people who stream movies to iPhones and iPads? Yeah... well I'm that guy. I spend quite a bit of time around the house doing all kinds of house things and I watch a lot of Netflix and various podcasts on my phone and tablet. In the morning I sync up the phone (which takes forever) in order to get the latest podcasts to watch while I'm getting ready for work and making breakfast. I no longer have to do that. It's saving me time and space because I am not constantly shuffling things around. So maybe Home Sharing does change how I manage my 32GB of storage after all. I read some articles today that said that the rules for iOS Home Sharing were the same as with OSX. The implication in a few cases seemed to be that each device would count against your activation limit. This did not really seem to make much sense to me and it does not appear that this is the case. If I find out differently, I will post an update. Another interesting item of note. 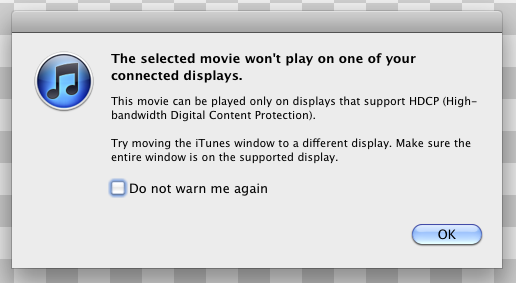 I have been bitten a couple of times when I have purchased some HD video content through iTunes, only to be stonewalled by the HDCP on my 30" Dell display. My options were to get the standard definition version or to watch it on the 15" MacBook Pro. Well those videos play just fine on my iPhone. I guess it's possible that I am getting some reduced resolution, but I am frankly surprised that it worked at all. Regardless, it looks pretty good on the Retina display. At least it's another option until we can finally do away with this HDCP nonsense. If Home Sharing seems like something you would find useful, don't put the update off.